3DMark is now available on WeGame, China’s largest and most popular games platform. China is the world's largest gaming market, making 30% of global revenue in 2018, according to Statista. 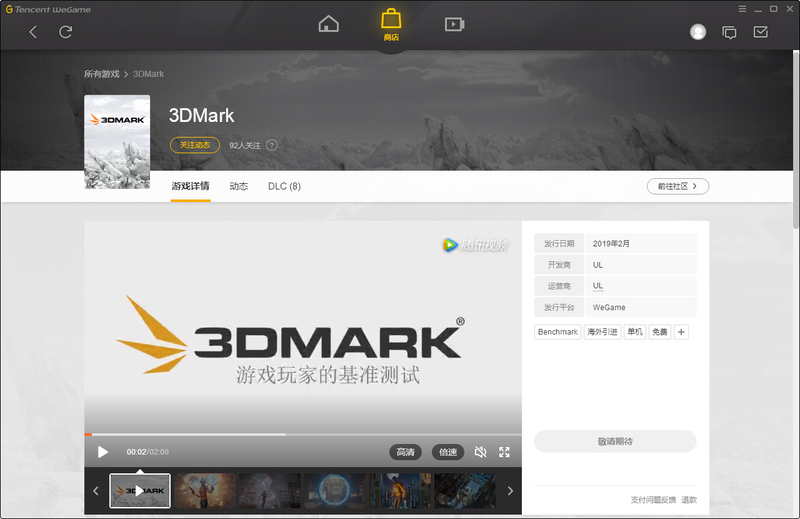 "In recent years, China has risen to become our number one market for 3DMark sales by volume. We see that Chinese gamers are very passionate about PC performance. I'm delighted that we can now introduce 3DMark to more Chinese gamers on WeGame, China's number one online gaming platform." 3DMark is a popular PC benchmark for gamers, overclockers and system builders who want to get the most out of their hardware. When you benchmark your PC with 3DMark, you get a score that you can use to compare systems. Running 3DMark is a great way to measure the effect of overclocking and check that your PC is working properly. 3DMark also offers a fast and convenient way to compare components if you're planning to upgrade. Find out more: https://benchmarks.ul.com/3dmark.